Award-winning author James O'Dea has created a handbook for those interested in Sacred Activism, a fusing spiritual knowledge with radical action. O'Dea outlines the polarities between the inner path of spiritual growth and the outer path of social activism, concluding that the two must co-exist in equal weighting so that the human race can become a compassionate force for good. 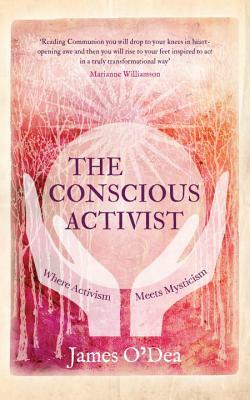 'James O’Dea is a modern-day prophet who has journeyed further than anyone I know in the ways of peace' Lynne Twist 'The Conscious Activist is a major contribution to the most important movement of our time - one that fuses profound spiritual awareness with radical action. It is wise and passionate and superbly written, with the kind of graceful but pungent clarity that only long experience can engender' Andrew Harvey 'After reading The Conscious Activist, you will drop to your knees in heart-opening awe and then you will rise to your feet, inspired to act in a truly transformational way' Marianne Williamson An extraordinary and rousing manifesto from award-winning author James O’Dea, The Conscious Activist is both a compelling narrative and a deep reflection on the demands of mystical realization and effective activism. Throughout the book, O'Dea poses that an integration of the two has the power to permanently transform the social order and to wake up humanity from its course of rapid self-destruction. Divided into two parts, Part I offers parallel narratives of author James O’Dea’s training and spiritual development as both a mystic and an activist. The mystic, he explains, must move past petty ego concerns in order to experience oneness with each other and our divine source. The activist, on the other hand, explores the role of passion and conscience in activating social change. In Part II, O’Dea pursues this fascinating concept of a meeting ground between the two worlds, where spirituality and action unite to spark an accelerated transition towards our greater goal: a more evolved civilization. He asks us all to become conscious activists – to learn, collectively, how to move beyond our rigid conformity to beliefs of the past and its archaic structures of power and control. James O'Dea, www.jamesodea.com is award winning author of Cultivating Peace. He is lead faculty for the Shift Network's acclaimed global Peace Ambassador Training. He has conducted frontline social healing dialogues around the world for many years. He is former president of the Institute of Noetic Sciences, Washington office director of Amnesty International and CEO of the Seva Foundation. He is a member of The Evolutionary Leaders group founded by Deepak Chopra and is on several advisory boards such as The Peace Alliance and Kosmos Journal. He is followed extensively in social media and lectures widely. James grew up in Ireland and England and currently resides in Colorado. The author lives in Crestone, CO.